Today’s leading-edge science is shattering old myths and rewriting the story that will shape the future of human civilization. A paradigm-altering synthesis of science and society reveals the planet is in the midst of an incredible evolutionary event … the emergence of a new species, a super-organism… Humanity. Evolution is almost always defined in terms of ever-increasing organismal complexity and awareness. In Darwinian terms, evolution from the most primitive bacterial cells to the origin of human beings is conventionally perceived as one continuous and imperceptible process of random mutations followed by natural selection (the old story of the survival of the fittest), that unfolded over billions of years. Since the introduction of Watson and Crick’s discovery of the DNA double helix and its genetic code, the public has been programmed that notion that genes control life and represent units of organismal awareness. Textbooks frequently refer to the cell’s nucleus, the repository of its “intelligent” genes, as the control center or brain of the cell. Amazing new insights offered by frontier science now reveal that the nucleus actually represents the cell’s gonads, its reproductive “organ.” In contrast, the cell’s brain is now recognized to be its “skin,” the cell membrane. Protein molecules built into the cell membrane perceive environmental signals (stimuli) and engage appropriate biological pathways that control cell behavior and genetic activity (responses). Membrane protein perception molecules represent fundamental units of awareness. Due to physical constraints, protein perception units can only be arranged as a monolayer within the structure of the membrane. The significance of this fact is that the amount of awareness possessed by a cell is directly proportional to the surface area of the cell’s membrane. Consequently, an increase in membrane surface area simply translates as more potential for intelligence. For the first 2 billion years of life on this planet the only organisms were simple single cells called bacteria (prokaryotes). The physical size of these primitive pill-shaped bacterial cells is constrained by an exterior rigid cell coat or capsule that limits their size. The first phase of evolution was focused on increasing the effectiveness of the bacterium’s information processing cell membrane. But when highest efficiency was obtained, evolution momentarily stopped because the bacterium’s constraining capsule limited further expansion of its membrane. This necessitated a change in evolution’s tactics, rather than focusing on making a smarter bacterial cell, evolution was advanced by individual cells coming into community and sharing awareness. Bacterial cells created a variety of mechanisms to communicate with each other, including the creation of viruses (the equivalent of DNA “memory sticks” that can be used to exchange information “files”). Later, specialized communities of bacteria created an enveloping external membrane that would surround and house their community. Called biofilms, these communities were endowed with an internal skeleton to support its expansive membrane and did not require a constraining external capsule to maintain support. The enveloping membrane provided the bacteria with a controllable “domain,” in the same manner that humans construct houses to survive in an ever changing, and sometimes hostile, environment. Overtime, the external membrane became so specialized it essentially led to the creation of a new form of biological “cell” called a protozoan, represented by unicellular organisms such as the amoeba. While the amoeba is perceived as a “new” organism, in truth it is actually an evolved form of a bacterial community. The story of the evolution of the amoeba from a community of bacteria is embodied the official motto of the United States, e pluribus unum … out of many one. Protozoan cells are a thousand times larger than their primitive bacterial precursors. The profoundly larger surface area of the amoeba-like cells provided them with far greater awareness. The next period of evolution saw further advancement in the effectiveness and efficiency of the protozoan’s cell membrane. And once again, a physical constraint caused evolution to come to a momentary standstill. Protozoan cells resemble water-filled balloons. The cell membrane, like the “skin” of the balloon, can be stretched to accommodate the protozoan’s more massive cytoplasm. However, like a balloon overfilled with water, the cell membrane “skin” can easily rupture and spew its contents causing the cell to die. Because of the membrane’s fragility, expansion of the awareness providing membrane again reached a physical limitation. Evolution could not make a “smarter” amoeba. In following its earlier pattern, Nature created more aware organisms by assembling single protozoan cells into multicellular colonies to share their awareness as coherent communities. In the first amoeba colonies, protozoan cells shared awareness yet they did the same jobs. When cellular communities got too large, it was more efficient for the cells to take on specialized functions. This led to the creation of differentiated tissues and organs that are characteristic of the unique communal organizations we recognize as animals. A human being, though perceived as a single entity, is in fact, an advanced community of 50 trillion specialized amoeba-like cells. Over the last 200,000 years, evolution has endowed human beings with more awareness and intelligence. When the human nervous system reached its full potential, evolution again came to a stop point. To further enhance evolution and human survival, people began to assemble in to simple communities. In its earliest form, individuals in these organizations all participated in the same hunter-gatherer activities. As human communities enlarged, it was no longer efficient for each individual to do the same job. This led to “differentiation” in which humans acquired specialized jobs and skills to support the life of the community. Human communities began to assemble into tribes, city-states and eventually into nations, multi-“cellular” organizations that encouraged the expansion of human intelligence and awareness. In spite of our advanced evolution, the history of human civilization has been fraught with continuous violence and war among the humans. The limited awareness of who we really are and our failure to realize that we evolved to support the development of the biosphere has brought human civilization to the brink of extinction. The Internet is a profound evolutionary achievement for it represents humanity’s nervous system uniting all humans into a single organism. The spread of new ideas and higher awareness through the Internet is provoking people from all over the globe to realize that we are all One. At the current moment the survival of Humanity is in question because it is experiencing “autoimmune” disease, a life-threatening situation in which the cells of an organism attack each other. Today’s world crises include among others, economic and political upheaval, global climate change and the challenge of peak fuel. While many fear these crises, they are necessary for they are driving us to create a more Earth-friendly and sustainable civilization. Knowledge is derived from observing patterns. 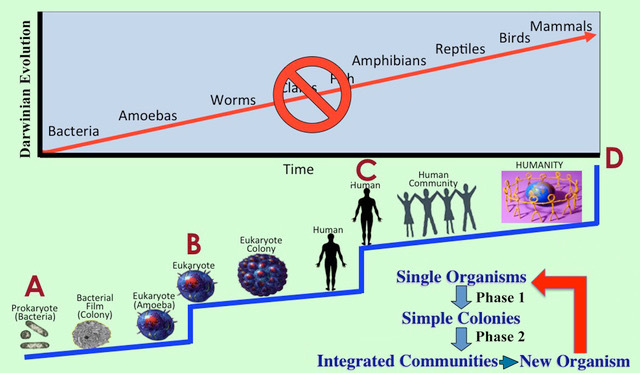 The history of evolution reveals a repetitive pattern of organisms evolving into communities of organisms, which then evolve into the creation of the next higher level of organisms (see illustration). When these universal patterns are used to assess the state of human civilization, they reveal the evolution of our human species is on the path toward a hopeful and positive future. “If things are so hopeful, why do we have such a mess right now?” Crisis ignites evolution. The challenges and crises we face today are actually signs that we are about to face our evolution. The insights offered by science tell us that the evolution before us is not a passive process. Because humans have free will, we can choose to either rise to that new level of our emergence or, in the manner of dinosaurs, fall by the wayside. Each of us is an active contributing participant in creating our future. A miraculous healing awaits this planet once we accept our new responsibility to collectively tend the Garden rather than fight over the turf. When a critical mass of people truly own this belief in their hearts and minds and actually begin living from this truth, our world will emerge from the darkness in what will amount to a spontaneous evolution.